The final is at Wembley Stadium on Saturday, August 27. Featherstone Lions and Lock Lane both have away ties in the Ladbrokes Challenge Cup second round on Saturday. Lions, who reached the fourth round last season, visit Hull Dockers while Lane travel to Shaw Cross Sharks. Other second round ties are Kells v Underbank Rangers, Millom v Pilkington Recs, Hunslet Club Parkside v West Hull, York Acorn v Distington, Wath Brow Hornets v Oulton Raiders, Egremont Rangers v Rochdale Mayfield and Siddal v Northumbria University. Nine winning teams progressing from the second round will face teams from Kingstone Press League One in the third round on the weekend of February 27-28. Kingstone Press Championship sides enter at the fourth round stage (March 19-20). 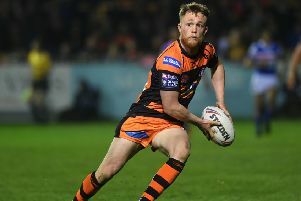 The bottom four clubs in the 2015 First Utility Super League season enter in the fifth (April 16-17) with the top eight Super League teams in 2015 joining the competition in the sixth round (May 7-8).